IR Engraving machinery has been responding to market needs for over 100 years with precision engineered embossing and calendering systems. Our rolls and machinery are constructed on proven technologies and custom-built to exact parameters essential to your application and product. Our roll technology and configurations are critical to a successful calender design. 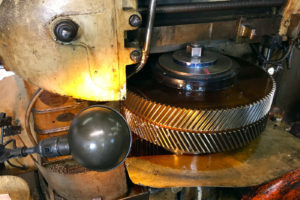 These steel rolls are constructed using double-shell forgings and designed to maintain a uniform roll-face temperature within 2°F (1°C) while operating up to 500°F (260°C). 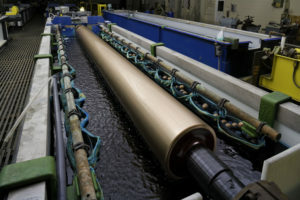 Options for our metal rolls include nickel or chrome plating, release coating, precision grinding, crowned or hardened. We also offer resilient rolls (fiber filled or covered). Our fiber fillings include proprietary HRCC (heat-resistant carded cotton) and HRWC (heat-resistant wool cotton). 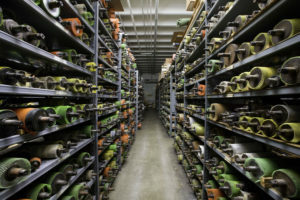 We have constructed countless roll configurations over many years, any one of which may be adapted to your specific application. IR Engraving offers a full-range of calendering machinery including thermal laminators, thermal and point bonding calenders, embossers and lab calenders. IR Engraving is recognized as the leader of high-pressure, precision thermal-bonding and laminating calenders. Applications include construction, filtration, agricultural, medical, and personal care/hygiene. What Sets IR Engraving Apart? Our 100% Commitment to Customer Satisfaction! At IR Engraving, we operate as part of each customer’s production team. That means if you need help with troubleshooting, want to rebuild an older piece of equipment, or need optional accessories to produce your materials, we’re there with technical advice and expertise to make it work. Here at IR Engraving, we have an in-house laboratory equipped with a four-roll, 22″ wide calender providing 5000 PLI nip loading and 400 FPM speed. With temperature control up to 550°F and an extensive inventory of lab rolls, our lab calender exhibits virtually exact working conditions and product performance. IR Engraving’s calendering systems and rolls are precision-engineered and constructed for years of trouble-free operation. Our systems and components are based on proven technologies and then customized with the exact parameters you need for your materials and application.